Sunset Overdrive is nothing if not crazy, and despite being arguably a game about the zombie apocalypse (that is, an Awesomepocalypse brought on by evil fizzy drinks), it brings a hefty dose of color and fun to the Xbox One. If you’ve seen anything about it, you’ve probably guessed it’s somewhat self-aware, and nothing makes that clearer than the bait-and-switch of its E3 trailer. We didn’t come out of E3 with a lot of new information about Sunset Overdrive, but fans got to see plenty of its wacky style. SunsetTV even uploaded a special video that details the game’s presence at E3. Yes, you’ll be killing lots of zombie-like enemies in Sunset Overdrive, but it’s lighthearted and focuses on fun. You’ll be able to play it with you friends, as it supports up to 8-player co-op. That will definitely ratchet up the insanity another notch. If you’d like to see more colorful chaos to make up your mind about Sunset Overdrive, check out this video, courtesy of GameSpot, of the stage demo shown later on at E3. Sunset Overdrive will be released on October 28. We’re not sure why October is such a popular month for game releases this year, but we hope you’ve either prioritized or set aside a lot of money. 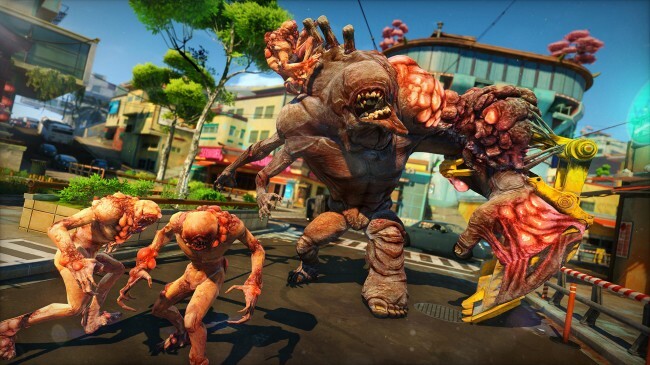 Is Sunset Overdrive on your list of games to get?